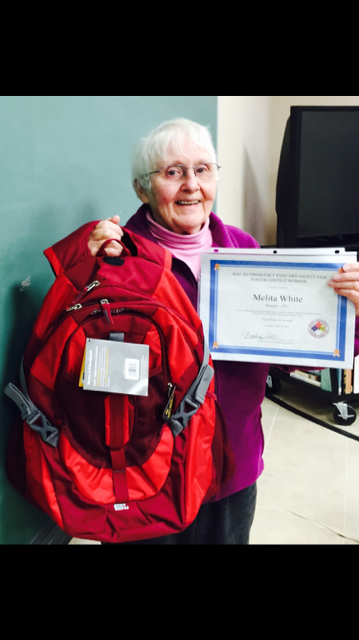 Willow CERT Member, Melitta White, Winner! Willow CERT Member Melitta White won the 2015 Mat Su Borough Emergency Preparedness Expo and Safety Fair poster contest for the senior division. She chose the theme of fire prevention for her poster. At the October 6th Borough Assembly meeting Bea Adler from the Local Emergency Planning Committee presented her with a certificate and a backpack filled with items useful for emergencies. Ms. White completed CERT training in 2014. She has been actively involved with CERT in response to the Sockeye Fire, the July 4 th parade, and the Emergency Preparedness Expo.